That they turned out so well in the end is actually rather a surprise. I originally attempted to make my own buckwheat pita breads. Well. It ended in a catastrophe. I wanted to keep it simple and made a dough of buckwheat flour, water, dry yeast and some olive oil. It turned out far too sticky to be manageable and I kept adding flour and adding flour and adding flour – horrible. I finally managed to roll them out and fried some in the pan and baked the rest in the oven, but the result was nothing but an unpalatable, hard disk. Utterly frustrated I went to buy some tortilla wraps….Please feel free to share your experiences or recipes for buckwheat pitas or wraps! Maybe one day I will have another go – certainly not too soon. 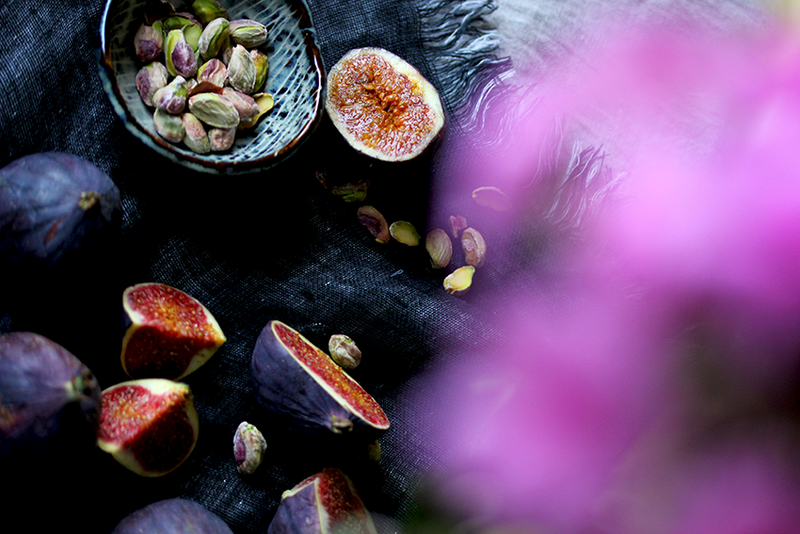 My inspiration for this dish was the celebration of the fig. To me a really precious crop. Like the pomegranate it somehow – even within our globalized food market – has preserved its air of being special or even royal. At least in Northwest Europe. I’ve recently been on a beautiful Dalmatian island, in the very south of Croatia, and on a hike stumbled across a remote olive and fig orchard. No one seemed to care, but the butterflies and wasps, and the ripe figs were bursting right on the tree. I couldn’t help myself and picked some – the best hiking snack I ever had. 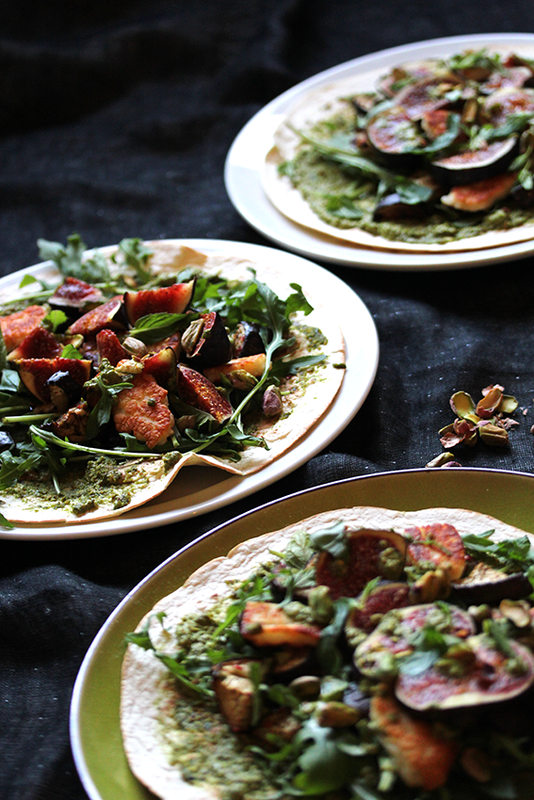 I hope these picnic wraps capture a little of this late summer feeling with the figs’ sweetness, the saltiness and richness of the halloumi and the pistachios rounded with some minty freshness. If you’re using roasted, salted pistachios, set a few aside and soak the rest for about an hour in some water. Quarter the aubergines lengthwise and slice into regular slices. Mix in a bowl with 1-2- tbsp olive oil, cumin, salt, black and slightly crushed pink pepper and minced garlic. Place on a baking tray and put in the preheated oven for 20-25 minutes at 200°C until the aubergine is softened, but also slightly crunchy. To make the pesto, set a few mint and basil leaves aside. Drain the pistachios and blend with herbs, juice of 1/2 a lime and 2-3 tbsp olive oil. Add some water if necessary to reach the desired consistency. Season to taste with some more lime juice, salt and pepper. Slice the halloumi and fry it in coconut oil or – much better – if you are having an outdoor barbecue: grill it! Slice the figs. In a pan without oil heat the tortilla wraps for 1-2 minutes on each side. 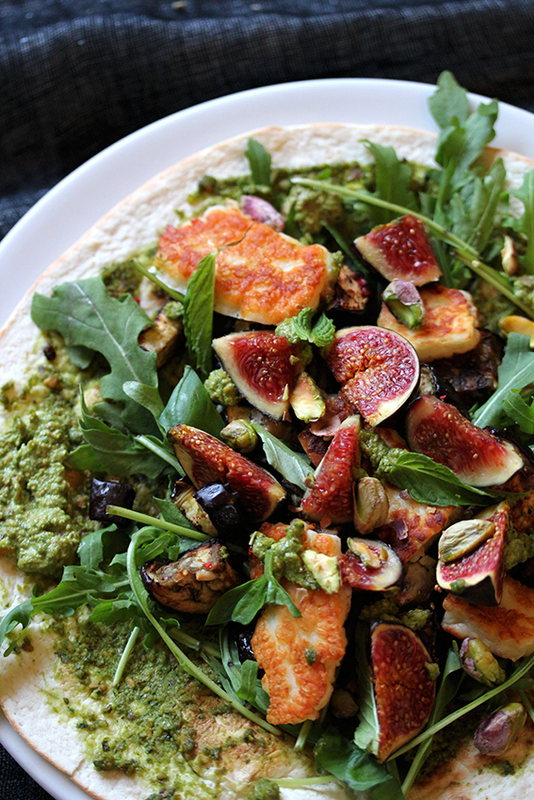 Spread the warm tortillas with the pesto, place roasted aubergines and rucola on them, top with halloumi and figs and sprinkle with remaining herbs, pistachios and a squeeze of lime juice. Roll up the wrap – I found parchment paper and some kitchen string very handy.